Established profiles on Facebook, Twitter, Tumblr, Instagram, LinkedIn and Pinterest. Blogs as websites; an opportunity to generate online presence for ideas, artists, events and projects using the WordPress platform. Produced a video documenting the process of creating Margaret Aull’s solo exhibition, Concealed Ancestors (2013) for Papakura Art Gallery. Shot and directed by Leilani Kake with funding from Creative New Zealand. Produced a series of videos for the South Auckland Pacific Arts Summit (2011) with local videographer Tanu Gago to engage audiences and stimulate attendance for events, also to create high quality promotional resources as a service to the artists. 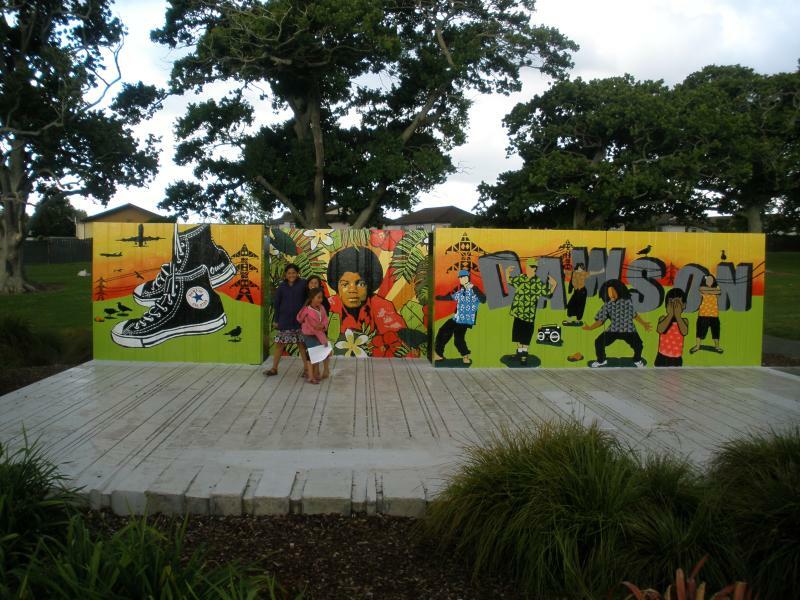 The Dawson Road Mural Project (2009) engaged users of the Ferguson Oaks Reserve in Otara to generate a creative brief to inspire local artists to design a site-specific mural for the Reserve. Funded by Manukau City Council, the project was produced in partnership with Manukau Beautification Charitable Trust and Tupu Youth Library. The video was created by artist, Janet Lilo whose art practice reflects interests in youth culture, digital identity politics, trends and suburban sub-cultures. The video proved to give the park users centrality within the project, but failed to inspire a design that truly reflected the interests represented in the video. The final design was then custom-made by the project team and led by Nicole Lim, Gallery Assistant – Fresh Gallery Otara and locally trained graphic designer. Short interviews conducted via email are designed to enable audiences to hear the ‘voice’ of the subject / artist. They become a resource for the artists and valuable mechanism for sharing the event / wider project with their personal networks. Artists from the PIMPI Winter Series: Sione Monu, Talafungani Finau, Genevieve Pini, Faafeu Kapeneta, Niutuiatua Lemalu. Documenting young people at the annual Polyfest Festival to create an archive of youth style and visual identities. Produced in partnership with local photographer, Vinesh Kumaran, funded by Manukau City Council (later Auckland Council) and Manukau Institute of Technology (MIT). Photographic images shown in exhibitions at Fresh Gallery Otara and Mangere Arts Centre – Nga Tohu o Uenuku, published in SOUTH (Issue 2) and on permanent public display at MIT Manukau Campus. Basic strategy employed during The Veiqia Project events (2015) as a mechanism to invite audiences to offer responses and feedback and create share-friendly links to the project.